LANSING — Neogen Corp., the Lansing biotech firm, announced net income of $17.5 million or 33 cents a share in the fourth fiscal quarter ended May 31, up 41 percent from $12.5 million or 24 cents a share in the same quarter a year earlier. Revenue was $109.3 million, up 11 percent from $98.8 million in the same quarter a year ago. For the full fiscal year, net income was $63.1 million or $1.21 a share, up 44 percent from $43.8 million or 86 cents a share a year earlier. Revenue was $402.3 million, up 11 percent from $361.6 million in the prior fiscal year. Revenue and net income for the fourth quarter and the 2018 fiscal year established new all-time highs for the 36-year-old company. In both the current quarter and year, Neogen benefitted from lower corporate taxes enacted in December 2017 and changes in the recognition of excess tax benefits from employee stock option exercises, which contributed to an effective tax rate of 12 percent for the quarter and 14 percent for the year. The fourth quarter was the 105th of the past 110 quarters that Neogen reported revenue increases as compared with the previous year — a record spanning more than 27 years. Gross margins for the company were 47.3 percent in fiscal 2018, down from 47.6 percent in fiscal 2017. Operating income was $70.2 million, or 17.5 percent of sales, in the current fiscal year, compared to $64.9 million, or 18 percent, in the company’s 2017 fiscal year. Revenues for the company’s Food Safety segment rose 14 percent during the current fiscal year compared to the prior year, aided in part by the acquisitions of Quat-Chem and Rogama. The segment’s current year results included a 13 percent increase in sales of test kits to detect drug residues in milk, in part driven by new test kits to detect drug residues of special concern in Eastern Europe. Neogen also recently launched BetaStar Advanced tests for beta-lactam and tetracycline antibiotics in milk. These new tests were developed for the U.S. market, and are designed to be performed with Neogen’s new Raptor testing platform, which can be used with a number of other Neogen diagnostic tests. Sales of Neogen’s rapid diagnostic test kits to detect food allergens, including gluten, milk, soy and peanuts, rose 12 percent in the current year. This increase was aided by increasing global food allergen regulatory efforts, and continuing strong sales of Neogen’s product to simultaneously detect six tree nuts with one test. Sales of the company’s general sanitation products increased 18 percent in the 2018 fiscal year, compared to the prior year, and sales of its foodborne pathogen detection tests increased 16 percent — including a 27 percent increase in sales of tests to detect Listeria. In the current year, revenues from international sources increased to 37.6 percent of total revenues, compared to 35.8 percent in the prior year, aided in part by acquisitions. Neogen Europe’s revenues rose 11 percent in U.S. dollars, Mexico-based Neogen Latinoamerica’s sales increased 13 percent, and Neogen do Brasil’s revenues increased 12 percent — each on broad-based increases across their product offerings. England-based Lab M’s sales rose 29 percent as its products have been increasingly integrated into the company. Neogen recently announced the full global harmonization of its Lab M and Acumedia culture media product lines, which have been rebranded as Neogen Culture Media. For the current year, the revenues from both Neogen China and Neogen India increased 18 percent compared to the prior year. While both are still relatively minor contributors to Neogen’s total revenues, they are seen as major growth drivers for the company as their rapidly expanding middle classes increasingly demand more animal protein products. Neogen’s Animal Safety segment reported a revenue increase for the current year of 8 percent, led by strong growth in the genomics business; a 15 percent increase in sales of its animal care line of products, which includes animal wound care products, vitamin injectables, and supplements; an 11 percent increase in its rodent control product lines; a 13% increase in sales of drug detection products; and a 23 percent increase in sales of detectable needles, which are engineered to be more resistant to breakage and detectable in standard metal detectors should they ever break. These increases compensated for lower sales of cleaners and disinfectants due to the termination of a distribution agreement in January 2017. Neogen’s worldwide animal genomics business recorded a broad-based increase of 22 percent in fiscal 2018 compared to the prior year. This increase was aided in part by the September 2017 acquisition of the Neogen Australasia genomics laboratory in Australia, but was driven more significantly by increases in revenues from genomic testing of beef and dairy cattle, swine, poultry, and companion animals at our previously existing locations. 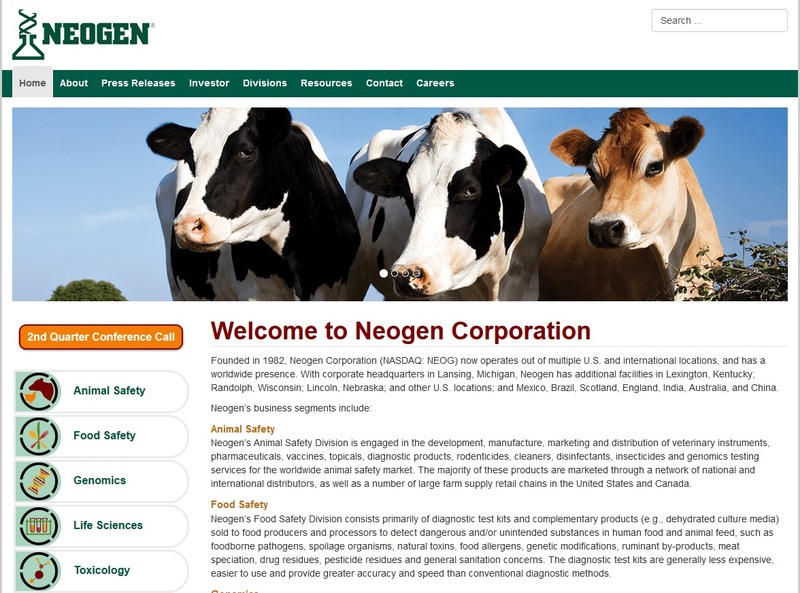 Neogen develops and markets products dedicated to food and animal safety. The company’s Food Safety Division markets dehydrated culture media and diagnostic test kits to detect foodborne bacteria, natural toxins, food allergens, drug residues, plant diseases and sanitation concerns. Neogen’s Animal Safety Division is a leader in worldwide biosecurity products, animal genomics testing, and the manufacturing and distribution of a variety of animal healthcare products, including diagnostics, pharmaceuticals and veterinary instruments.